3D printing is a much faster technology for making prototypes with complex geometry than conventional methods such as machining or milling. Explore how Geo Globe Polska, which specializes in vacuum thermoforming of thermoplastic materials, managed to shorten the time of implementing the prototype into production using an industrial 3D printer – 3DGence INDUSTRY F340. In our company we use modern technologies, so the idea of using 3D printing appeared naturally. It allows us to speed up the prototyping process, especially for our customers from the automotive industry. Geo Globe Polska uses 3D printers to produce prototypes of transport containers used in production lines. The time it takes to create the prototype plays a key role in the execution of the order for the end customer. The company set itself the goal of shortening the process of constructing prototype molds, which usually is very long. In addition, it consists of many stages. Production of the first model is the basis for serial production, therefore each change in the prototype made with the use of traditional machines prolongs the lead time. The use of 3D printers made it possible to reduce the time of prototyping the transport containers from a few weeks to a few days. The use of 3D printers allowed Geo Globe Polska to efficiently verify the design assumptions, including checking the fit of the detail. An industrial device such as the 3DGence INDUSTRY F340 makes possible to create details with high accuracy and tolerances. Thanks to the 3D printed transport containers, the manufacturer can check the structural assumptions at the planning stage before forming the prototype itself. Using 3D printers we can verify the design and accuracy of the prototype. We are able to eliminate possible mistakes, which could lead to the necessity of making another, expensive prototype form. 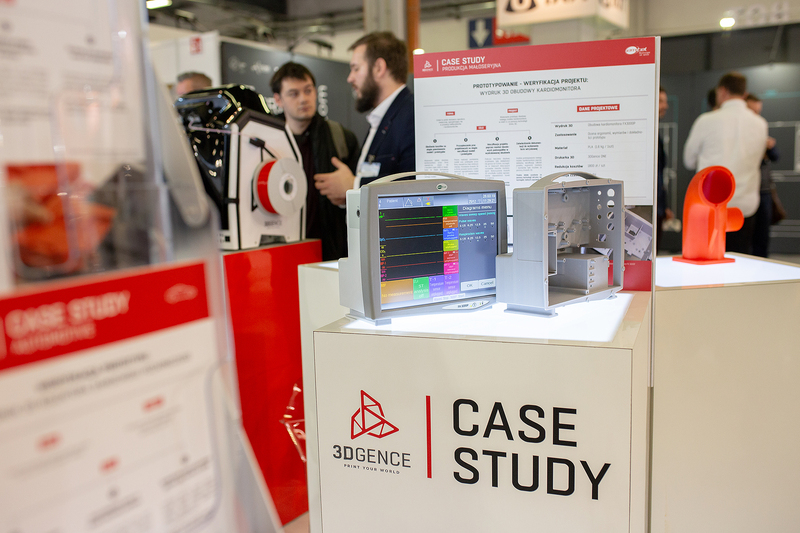 The use of 3DGence INDUSTRY F340 enabled us to reduce project lead time and minimize the costs. Printed prototypes of transport containers are also used to accelerate the programming process of industrial robots located at production lines. The implementation time of a new line in a car plant can be reduced up to three weeks. Dedicated trays are finally used to secure the finished parts during the production process.